Chess is a game of perfect knowledge. Theoretically, every possible move and counter-move can be predicted. All things being equal, luck is never a deciding factor in a game of Chess. Victory will almost always go to the better player. And that last part speaks directly to why Chess can be a bit of a downer. Between opponents of equal skill, Chess is as enjoyable as it is civilized. Between rivals of even marginally different ability, Chess can be as one-side as a boxing match between Mike Tyson and Pee Wee Herman. It is in this dissonance between players of varying skill that Warhammer 40,000: Regicide makes Chess a better game. Specifically, Hammerfall Studios has introduced chaos (with a small c) into Chess. In doing so, they’ve effectively thrown out decades of prefixed Chess gambits and leveled Chess’ playing field. Regicide unfolds in two phases: movement and initiative. The movement phase is the same as a traditional game of Chess: pick a piece and make a move, following the rules for pawns, castles, bishops, knights, kings, and queens. The initiative phase takes a page from the likes of X-Com or Jagged Alliance. Space Marines and Orks spend action points to shoot, throw grenades, launch psychic attacks, or call in air strikes. No longer are white and black bishops limited to hurling foul language at each other from adjoining squares. The inevitable fusillade of bolter fire in the wake of each move makes Regicide a much more tactical game than Chess. A good Chess player uses their army to set up areas of control. Regicide doesn’t offer such luxuries. A player who moves a lone bishop or a knight to the middle or far side of the board risks having a high-value unit cut to ribbons. Likewise, whatever anxiety a Chess player feels toward moving their queen (now a Librarian or Weirdboy) from the relative safety of the first rank is all the more present in Regicide. The net-result is a game that puts Chess experts and amateurs on the same page. There may be some value to playing a traditional gambit against a foe in Regicide, but said gambit never imagined pawns at loggerheads being anything more than fence posts. 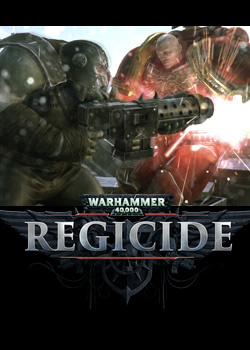 Regicide lets those pawns toss grenades into the back ranks and shoot each other in the face – or at least try to. Though both the Space Marines and Orks have a better to-hit average than the typical X-Com recruit, missing on a 95% to-hit attack remains a maddening experience. I expect most people will latch on to the game for the multi-player element. For those more inclined to play on their own, I am reasonably satisfied with the game’s single-player campaign. Take away all the veneration of the Immortal Emperor and the campaign is little more than a series of Chess problems. Albeit, they are Chess problems with heavy bolters and lascannons, and that counts for something in my book. A Chess nerd looking to revel in a decent WH40K story should be fine with the single-player. If someone goes looking for a campaign to rival Dawn of War or Space Marine then they will probably be disappointed. Tailor your expectations appropriately. The multi-player side of the game is similarly first-rate. My wait times for a game are relatively short. Notwithstanding the odd connectivity error in trying to set up a game, I experienced nothing but smooth sailing and solid competition once I got into things. Visually, the game is at its finest when showing off the combat animations that occur when killing a piece through a Chess move. Should I ever grow tired of watching a Space Marine slice an Ork asunder with his chainsword, then I’ve grown tired of living. Glorious as those animations are, I would have liked to see a bit more animation on non-lethal hits. However, this point is far from a deal breaker for the game. For the record, I reached out to Hammerfall with the inevitable question of, “Can I get an Eldar/Chaos/Imperial Guard/Tau army as future DLC?” I’ll update this review once they get back to me. It would be folly to write off Regicide as a WH40K themed take on the Battlechess. Regicide’s strength is found in its ability to iterate on Western civilization’s most iconic tabletop game. Regardless of if a person fancies themselves a chess enthusiast or a master-level player, they will find Regicide to be a welcoming experience.